YOSHIKI defines #CantStopWontStop as he goes from European Tour to VAMPS Halloween Party | VKH Press – J-Rock & Visual Kei Coverage Worldwide! 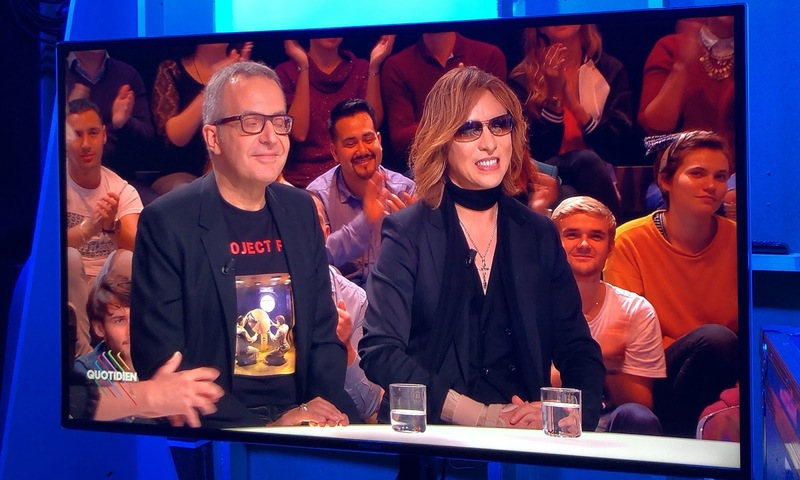 Starting in Berlin, YOSHIKI barely paused to catch his breath as he began a 10 country tour of Europe over a span of just two weeks. Bringing Q&As, interviews and meet and greets for fans at the screenings, YOSHIKI went to great lengths to share We Are X, the story of X Japan. Despite the disappointing cancellation of his Iceland appearance, YOSHIKI did his best to make up for it, sending hundreds of signed photos to the fans who had come to show their support of him in Iceland and missed the opportunity. The tour itself was a success - it's been announced that We Are X was screened in over 50 theaters in Paris alone! Immediately after the final day of the promotional tour, YOSHIKI flew directly from France to make the October 29th concert at Makuhari Messe. 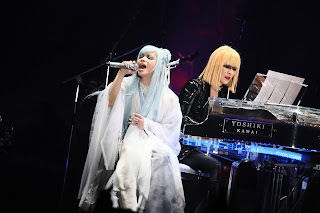 YOSHIKI and Hyde first teamed up at VISUAL JAPAN SUMMIT 2016, and performed together again at Halloween Party 2016 - one year later they reunite to bring us an ode to Blade Runner, and a chilling "Yuki-onna". For their third collaboration, the stage curtains drew back to the sound of X JAPAN’s Kurenai on piano as YOSHIKI appeared on stage as the female character Pris from the film Blade Runner. Next, Hyde appeared on stage in a “Yuki-onna” (“snow woman”) costume to the intro from Jojoushi by L’Arc～en～Ciel, bringing the crowd to a wild applause. The two artists spoke to each other about their friendship, with Hyde repeating how glad he was that YOSHIKI could come, and YOSHIKI replying, “I’d do anything for Hyde!”. They performed a piano and voice duet of Endless Rain by X Japan, bringing the arena together in song. Hyde and YOSHIKI both said it was their favorite performance together, saying “it felt like a dream to be singing”, and “it felt like a dream to be playing”. After the concert on the Yoshiki Channel broadcast, YOSHIKI explained his Halloween costume choice — Blade Runner 2049 had just opened in Japan days before, and YOSHIKI felt a connection to the iconic character Pris from the original film. Pris struggled to come to terms with her fate, and rebelled against mankind. “She has the spirit of rock in her,” he explained, and added that he was looking forward to the new movie. “I can’t wait to see how the story has developed since the last film”.